Starter motor The starter motor plunger closes and the motor is supplied with battery power, which in turn cranks the engine, when the S terminal is supplied with electric power. Transmission range switch Supplies power to the starter relay and starter control relay (inside IPDM E/R) when the selector lever is shifted into the P or N position. IPDM E/R CPU inside IPDM E/R operates the starter relay when the ignition switch is in the start position. Clutch interlock switch (M/T Models) Clutch interlock switch supplies power to the coil side of the starter when the clutch pedal is depressed to crank the engine. ECM ECM controls the starter relay inside the IPDM E/R. The starter motor plunger closes and provides a closed circuit between the battery and the starter motor. The starter motor is grounded to the cylinder block. With power and ground supplied, the starter motor operates. 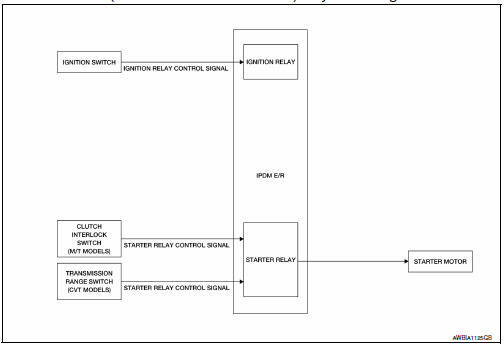 When the selector lever is in the P or N position, power is supplied to starter control relay by the transmission range switch. 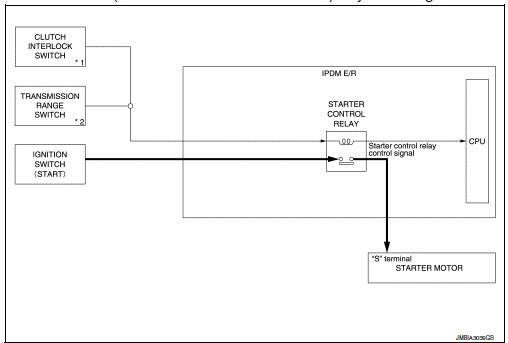 The IPDM E/R (CPU) detects selector lever P/N condition by the inputted signal. 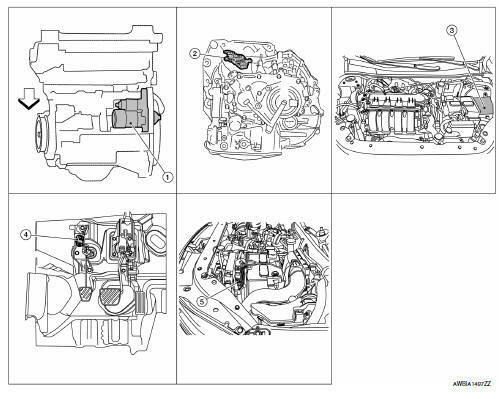 When engine cranking condition is satisfied, then battery power is supplied to starter motor (вЂњSвЂќ terminal) through starter control relay. When the clutch pedal is depressed, battery power is supplied to starter motor (вЂњSвЂќ terminal).